Scooby-Doo and the Curse of the 13th Ghost was an okay movie that at least did make be chuckle a few times and I did enjoy the connection with the old 1985-86 series, The 13 Ghosts of Scooby-Doo which was pretty cool. Another year and another Scooby-Doo direct-to-video feature film. But unlike their other films, which are standalones, this one at least is directly connected to the old 13 Ghosts of Scooby-Doo television series that lasted only a single season and ran between 1985-86 and was cancelled on a cliffhanger. Now there is Scooby-Doo and the Curse of the 13th Ghost which serves as a conclusion and, generally speaking, was a fun little movie. The movie finds the Scooby Gang — Fred (FRANK WELKER), Daphne (GREY GRIFFIN), Shaggy (MATTHEW LILLARD), Velma (KAT MICUCCI) and Scooby-Doo (WELKER) —sidelined following the mistaken “unmasking” of a menace in their latest case. They are forced to sell off their equipment, Mystery Van included, but they are drawn back in when they receive a message from Vincent Van Ghoul (MAURICE LAMARCHE) that he needs their help to capture the 13th ghost, which can only be trapped inside a special case. As Daphne and Shaggy reveal to Fred and Velma, one summer the two, along with Scooby, had helped Vincent Van Ghoul (voiced by Vincent Price in the original series) to imprison 12 of the ghosts after Shaggy and Scooby had accidentally let them loose. Now they’re back in action with a sporty new van which Daphne had kept locked away and Daphne herself has a styling new look herself. Although I wouldn’t consider myself the biggest fan of the 1000 various series and movies, I do find these Scooby-Doo direct-to-video flicks to be fun enough time wasters, even when the stories aren’t the strongest or the humor, and there were a couple moments, don’t always work (here, the whole pom-poms scenes were pin-dropping type of comedy). But what sets this movie apart is its connection to the 1985-86 short-lived series, though to be honest, even though it did air when I was around 5-years-old, I don’t really recall ever seeing it, maybe I was more interested in Fraggle Rock, The Real Ghostbusters and Mister Rogers Neighborhood. As such, this was a solid enough entry into the long-running series/franchise and I suspect kids, even if they don’t know anything about the old 13 Ghosts show, will still enjoy the jokes. This release comes with an embossed slip cover and only includes two Vintage Cartoons from The 13 Ghosts of Scooby-Doo, the pilot episode (‘To All the Ghouls I’ve Loved Before’) and series finale (‘Horror-Scope Scoob’). Normally I don’t rate this kind of “feature” but it is nice to have to watch before this movie; though I already do own the series DVD. 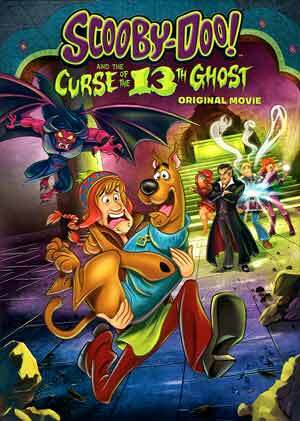 Warner Brothers releases Scooby-Doo and the Curse of the 13th Ghost is presented with a 1.78 anamorphic widescreen aspect ratio and colors do tend to be bright in keeping with the light-hearted nature of the film. The included Dolby Digital 5.1 track is serviceable but hardly anything tremendous. Dialogue did come through with fine clarity but the other elements were a bit too low, including some of the action/chase scenes. 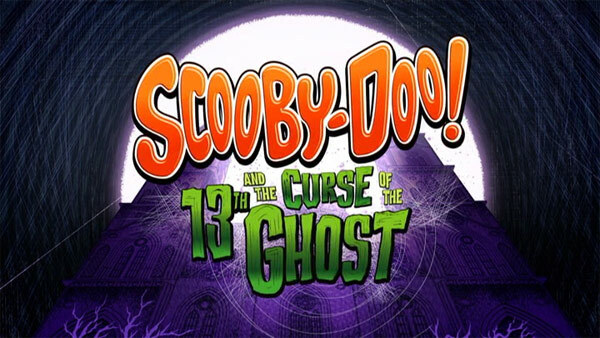 Overall, Scooby-Doo and the Curse of the 13th Ghost was an okay movie that at least did make be chuckle a few times and I did enjoy the connection with the old 1985-86 series, The 13 Ghosts of Scooby-Doo which was pretty cool, actually. This DVD release is, as many of the others have been, basic with only two bonus episodes but no actual featurettes or anything.